Gun buyback programs have been used by cities all over the country, such as this gun buyback program in Oakland, California, in 2012. Atlanta Mayor Kasim Reed and faith leaders are joining the NAACP in a gun buyback initiative. “We decided to take action. More than just pray for it and go to sleep,” said Rev. R.L. White, Jr., president of the Atlanta chapter of the NAACP. At a Monday press conference at Atlanta City Hall, Brown condemned what he called America’s culture of violence and called for fewer guns on the streets. “When we first initiated this buyback effort, it was out of necessity, not politics,” said Brown. The NAACP chapter still needs to raise $100,000 for the program. It would allow gun owners to turn in weapons for gift cards. 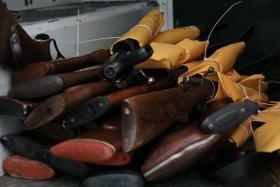 The date for the gun buyback is scheduled for January 16th, during the first week state lawmakers return to the Capitol. As was the case last legislative session, a bill seeking to loosen gun restrictions is expected to be high on the agenda. The bill, which didn’t pass last year but remains alive for 2014, seeks to expand gun-carry areas to churches, public buildings, and college campuses. Marshall Guest, spokesman for House Speaker David Ralston, said there’s still much interest in the bill. “There was a lot of conversation about that bill last year amongst members of the House and so I think you can expect the same level of attention in 2014,” said Guest. Flanked by faith leaders at Monday’s press conference, Mayor Reed stressed the importance of local efforts like the NAACP’s buyback initiative as a way to counteract state efforts to expand gun-carry areas. He said local officials must pick their battles. He said at the local level that means continuing to build on his first term, during which time the city reported fewer murders than it has in a generation. Reed vowed to continue bolstering Atlanta’s police force and building out the city’s video surveillance system.